Winning her the Best Actress in a Comedy or Musical at The Golden Globes, Roger Ebert declared that Madonna was “possessed” by the spirit of the late Argentinian B-movie star, who rose to political prominence as the wife of her country’s President, Juan Perón. “It is not only that she holds the screen with charisma and force in the film version of Evita but that she understands from the inside out how Evita invented herself – how she used fashion and stage presence and personal flair to make herself seem bigger than life,” the film critic continued in his review. As this week marks the anniversary of Perón’s untimely death at the age of 33, we take a moment to remember Madonna’s homage to the historical figure, and its wider impact on fashion. “Eyes, hair, mouth, figure; dress, voice, style, movement; hands, magic, rings, glamour; face, diamonds, excitement, image,” chant members of the chorus in the film’s musical number Rainbow High, during which Evita is made-over into a diamanté-drenched deity. “I came from the people, they need to adore me, so Christian Dior me from my head to my toes. I need to be dazzling, I want to be Rainbow High! They must have excitement, and so must I,” Madonna warbles, in what could possibly be the most relatable lyric of all time. Of course, things weren’t always so fabulous for Perón. As a young woman in the 1930s, she grew up in poverty, longing for fame, fortune and the bright lights of Buenos Aires. 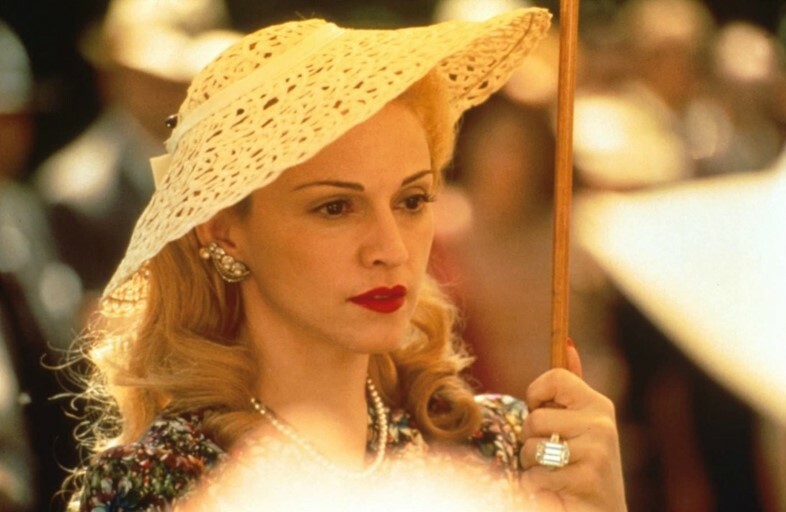 For Evita’s costume designer, Penny Rose, this meant dressing Madonna in Prada-esque tea dresses in shades of brown and dusky pink – and although they certainly inaccurately portray the reality of her social status, they offset her mahogany contact lenses perfectly. As the decades of Evita’s life unfold, Madonna begins to serve 1940s First Lady realness; with New Look silhouettes and lush fabrics, thinly penciled eyebrows and a pillarbox-red mouth offset by straw-blonde hair. During the progression of the film’s narrative, Perón’s character development is marked by a number of costume changes: 85 to be exact, taking the title from Elizabeth Taylor in Cleopatra as the most outfits worn in a single movie. What an achievement. 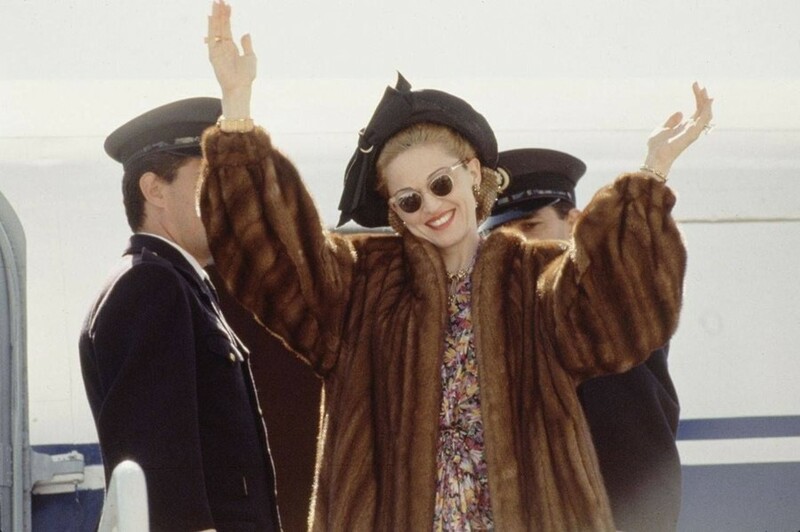 When the film was released in the mid-90s, fashion experienced a phenomenon which can only be described as ‘Evita-mania’. “Some designers and retailers say the film, a Walt Disney Company release, has handed them a whopping opportunity – nothing less than a chance to change the course of fashion as they promote a glamorous new look,” wrote Carol Lawson in the New York Times. Department store collections were launched in the likeness of Madonna’s Evita wardrobe, with places such as Bergdorf Goodman even selling hairpieces that would provide a Perón-like chignon with the flick of a few kirby grips. “People are already coming into my salon saying, ‘How can I achieve that look?’” John Barrett, the owner of Bergdorf’s salon told Lawson. In an article published just one month later in the same paper, Amy M. Spindler decreed that indulging the reincarnation of the Christian Dior New Look was a regressive move for the fuss-free women of the 1990s. Indeed, Spindler’s sentiment perhaps rings true today, but who wouldn’t want to indulge in just a little the sartorial fantasy of Evita, if only via slick of red lipstick? If Madonna approves, then so do we.